The award winning Copper Point Resort in Invermere, British Columbia, Canada opens its doors to the public this weekend. This luxury mountain resort is perfect for a weekend getaway, wedding, conference, or even offers both whole and fractional condo ownership. To the homeowners who believed and invested in us at the fore front of the project, I want to say thank you and welcome home to one of the most spectacular places in the world. The five billboard banners throughout the valley say it all, Resort Now Open! There is reason to celebrate this May long weekend as the award winning Copper Point Resort in Invermere, British Columbia opens its doors to the public this weekend. "What an incredible privilege it has been for me, to bring our vision for Copper Point Resort to life,” boasts Michellene Kandert Rohit Communities Owner Representative. "To the homeowners who believed and invested in us at the fore front of the project, I want to say thank you and welcome home to one of the most spectacular places in the world." Copper Point Resort was bought out of receivership by Rohit Communities in December 2009 and since then the company has been committed to bringing it all together. “We are proud of the hard work and determination of all people who had a part in making this happen" said Rohit Gupta CFO of Rohit Group of Companies. "We are a family based company who has built a reputation in the home building industry dedicated to quality homes and service, based on our integrity. Copper Point Resort is our first condominium resort property which will host families and generations to come." Copper Point Resort is located only three hours from Calgary, in the heart of the Columbia Valley between the Purcell and Canadian Rocky Mountains. It is in one of the most authentic ecological parts of the world where you can enjoy four season activities in one weekend depending on which time of year. This unique location offers everything from the Panorama Mountain ski hill, Lake Windermere, natural hot springs, world class jump spots for paragliding, hiking, snowmobiling and golfing. There are nine golf courses within a half hour of each other. The possibilities are endless when speaking of outdoor activities. Overlooking The Ridge at Copper Point fairway, this property offers something for everyone. This four season luxury resort includes indoor and outdoor pools, hot tubs, multi-use sport court, playground, walking trails, community fire pits and barbeque, fitness facility, business center, onsite market, 24 hr front desk and spa. To indulge your taste buds, Elements Grill restaurant and lounge is the perfect spot; whether it be the lounge for tapas, restaurant for your family and friends, sipping a glass of wine on the outdoor patio or spending a night in with room service. The amazing fresh local creations of the culinary team, lead by Chef Shane Bauer who brings year of experience from working around the world, will not disappoint. This dream destination is perfect for a weekend getaway, wedding, conference, or even ownership of your very own piece of luxury here at Copper Point Resort. The Grand Opening celebration is set for June 28, 2011 at the resort, where rising Canadian band The Sheepdogs will perform live. Everyone from valley residents, Copper Point Resort owners and valley visitors will get to see some of their idols perform that day and Copper Point Resort looks forward to giving everyone an experience to remember. Stay tuned for more details to come on the Big Grand Opening! 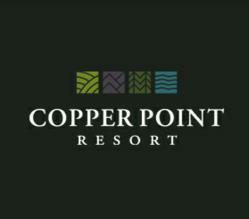 The award winning Copper Point Resort is the newest four season luxury resort located in Invermere, British Columbia. Now offering both whole and fractional ownership real estate and starting May 20, 2011, vacation accommodations. Year round attractions include premier golf courses, world renowned skiing, and the stunning Lake Windermere. Copper Point Resort condominium owners and guests will enjoy five star amenities including indoor and outdoor pools, trendy contemporary restaurant and lounge, fitness facility, spa and much more. Rohit Communities, a division of the Edmonton-based Rohit Group of Companies, is an award winning developer and home builder in Edmonton offering new condos, townhomes, duplexes and single family homes. It also offers new homes in Fort McMurray and luxury condos for sale in Kelowna. Rohit Communities newest addition to the group is Copper Point Resort.